Plastic Surgery Associates’ founder, Dr. Heather Furnas, compiles enlightening research on male and female cosmetic surgeons in the latest issue of Plastic and Reconstructive Surgery: The Journal of the American Society of Plastic Surgeons. Her article, Gender Differences in the Professional and Personal Lives of Plastic Surgeons, looks at the challenges encountered by both sexes while working in the specialty of aesthetic medicine. Plastic Surgery Associates is proud to present the latest research of practice founder, Heather Furnas, MD, with her recently released article in Plastic and Reconstructive Surgery: The Journal of the American Society of Plastic Surgeons. 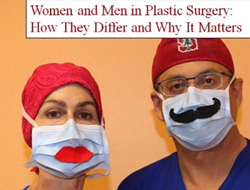 While the field of plastic surgery is largely dominated by men, Dr. Furnas’ article, Gender Differences in the Professional and Personal Lives of Plastic Surgeons, takes an unprecedented look at the challenges faced by both male and female surgeons. In addition to the information presented by the current plastic surgery community, Dr. Furnas unpacked data regarding the low number of female medical students choosing plastic surgery as a specialty. She determined that a variety of factors play a role in a woman’s specialty choice, such as lifestyle and the perception of plastic surgery’s family-unfriendly traditions. Dr. Furnas also discusses the significant benefits female surgeons bring to the specialty, including significantly lower mortality rates, higher than average patient review ratings and being the doctor of choice for most female patients. Plastic Surgery Associates was founded by Dr. Furnas and Francisco Canales, MD in 1992. Since its inception, the practice has grown to be one of the most respected plastic and cosmetic surgery providers in the United States. Dr. Furnas and Dr. Canales are both board certified plastic surgeons, each with more than 30 years of experience. They offer a variety of innovative, surgical cosmetic procedures, such as the rapid recovery breast augmentation technique, female genital rejuvenation, and the Mommy Makeover. Additionally, meeting the desire for nonsurgical techniques, Dr. Furnas and Dr. Canales have opened their Allegro MedSpa, bringing patients game-changing noninvasive techniques such as Botox, CoolSculpting, and Ultherapy. Dr. Furnas’ full article, Gender Differences in the Professional and Personal Lives of Plastic Surgeons, can be found online at Plastic and Reconstructive Surgery, the Journal of the American Society of Plastic Surgeons. For additional information on Plastic Surgery Associates, or to schedule a consultation with Dr. Furnas or Dr. Canales, call the Santa Rosa office at 707.537.2111. For patient convenience, Plastic Surgery Associates and Allegro MedSpa have a second location in Novato, California, as well. Those patients not from the northern California-area are encouraged to reach out to a patient coordinator for information on our virtual consultation, travel assistance and local lodging recommendations.